- All the rooms have got big windows and balcony giving you a lot of light and amazing views from the garden and the countryside. - Infinity pool (60 m2), in case of small kids, you can close the area next to it. - Outside the house, there are a pergola and two covered terraces on the first floor. One of them, with a barbecue and a big table for meals. - There is other barbecue on the garden. - In case you need more, in less than 1 km, you can go to Sant Josep with basic services (two supermarkets, several restaurants and shops). Also, near the town, you can easily arrive to a lot of beaches and some of the cities in Ibiza. Get the best of the countryside but be able to see something else if you want. * Swimming pool cleaning service. * Cradle and baby chair available if it is necessary. We are an ibizan family that rent and manage directly our houses. We live on the island all the year, we love Ibiza and we like make our customers feel comfortable and happy. Because here you will have all you need for have a great holydays: - An amazing place. - A good service. - A fully equipped place with all you need on a house. - A very well communicated area, easy to stay quiet but also to leave and see the island. - Competitive quality/price ratio, all the taxes are on the final price. I could not have been more pleasantly surprised.. the villa is nicer than the advertisement suggests. The outdoor areas have been kept immaculately and we found the villa very comfortable indeed. Location is great - 15 min walk from San Jose (dirt track so take trainers), and easy to get to various places on the island by car. The villa is right next to a pine wood, so if you like running this is a bonus! Anna and Pep were great to deal with (I had initial concerns around the contract not being provided until arrival but this turned out to be fine). Pep even made sure he ordered taxis for us to ensure the correct location was communicated to the taxi drivers. My flight was late on the final day, and Anna suggested I use the villa for the whole of the next day as no one else was arriving.. this was the icing on the cake for me. Wonderful week away.. would definitely book this villa again! We only can say thank you very very much! It has been a real pleasure having such a nice guests. As a native people from Ibiza, we work hard to offer a good experience and to share the beauty of the island, as well as provide all our attention and efforts to make sure that you enjoy a great holiday and feel that you are in your house. We're very pleased of your experience at our villa, and we hope to see you again. "First a would like to thank catalina, pepe and juan for everything...hope i will come back next year again ! About the finca : Everything was perfect. Very very clean and confortable. The location and the view from the finca very nice. The garden with pool : a dream ! It was not my fist time in ibiza but THE BEST ONE !!!" Wir fanden ein sehr gepflegtes und mit allem Noetigen ausstaffiertes Haus vor. Genauso wurde der Pool immer wieder neu gepflegt. Alle Schlafzimmer, Wohnzimmer, Baeder und anderen Raeumlichkeiten, sowie Terrassen gefielen sehr! Die Reinigungscrew, welche 2 x innerhalb 10 Tagen antrat, machte ihre Arbeit zur vollsten Zufriedenheit. Kurzum, besser geht es nicht! Als wir neben der Kapsel-Kaffee-Maschine um eine weitere Filter-Kaffee Maschine baten, wurde dieser innerhalb weniger Minuten gebracht. Die Vermieterin Catalina und Juan waren aeußerst sympathische, freundliche und hilfsbereite Menschen. Unsere Gruppe von 7 Personen kann dieses Haus nur empfehlen und wir werden mit Sicherheit im nächsten Jahr genau diese Villa wieder haben wollen. Nochmals Dank an Catalina und Juan die uns so einen angenehmen Urlaub moeglich gemacht haben!! Vielen Dank für Ihren Bericht, hoffen, Sie in unserem Haus wieder zu sehen. "We hebben het ervaren als een heerlijk huis met een prima servive van Joan die ons heeft ontvangen. Het huis was zelfs boven onze verwachtingen en komen hier zeker terug en heb het ook al bij div vrienden aanbevolen"
"The house is marvelous, fully equipped with everything you can think about, from dishwasher to washingmachine. 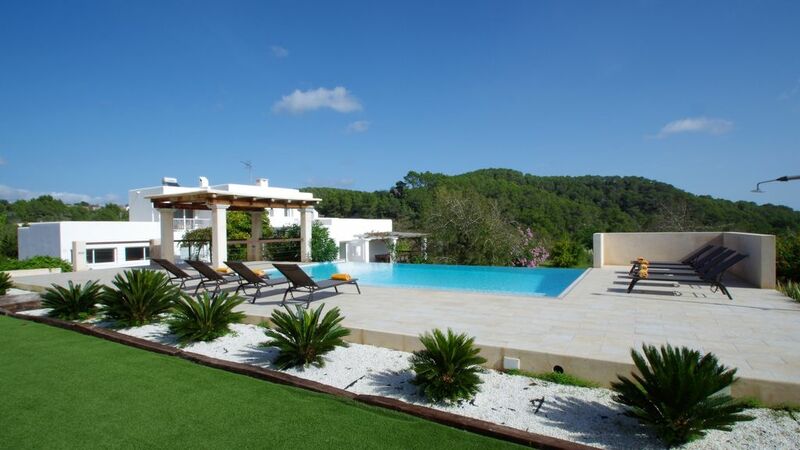 The location is very central, close to Ibiza city and all the beaches but still very private in the middle of nature. We saw deer and bunnies very close. The pool is great, every day it''s difficult to choose, see something from Ibiza or stay in the beautiful garden by the pool?" "alojamiento ideal para disfrutar en familia de unos magníficos días en la preciosa isla de Ibiza"
Just a 10 minute drive takes you into San Antonio, famously known for it's clubs and nightlife, whilst a 20 minute drive puts you in the heart of Ibiza Town, perfect for shopping, sightseeing, clubs, bars and restaurant. Las tarifas incluyen el 10 % de I.V.A, la tasa turística y dos horas de limpieza a mitad de la estancia.